Is the author an expert in the field? Who is the sponsor or publishing body of the site? Is the information provided timely? This is particularly important in areas of science, technology, health, and politics. Is publication date or “last updated” date included with the information? If the information is dated or historical, does the document refer to the source and year, e.g. “Based on 1990 U.S. Census data”? Does the author or web page sponsor have a bias? Is more than one viewpoint expressed on the topic? Does the author or publishing body have a particular agenda? Is the information freely available? Is the site complete or under construction? Does the information have a print equivalent? Does the information include references to experts in the field or rely on other sources? Does the information include a bibliography? Was an explanation offered on how the data was gathered and interpreted? Please ask if you need help in evaluating a particular internet resource – journalism@libraries.cul.columbia.edu or IM the Columbia Librarians! This entry was posted in Information Literacy, MA Students, MS Students, PhD Students, Research Tips and tagged evaluating sources, Information Literacy on March 28, 2012 by Cris. Where’d that data come from? 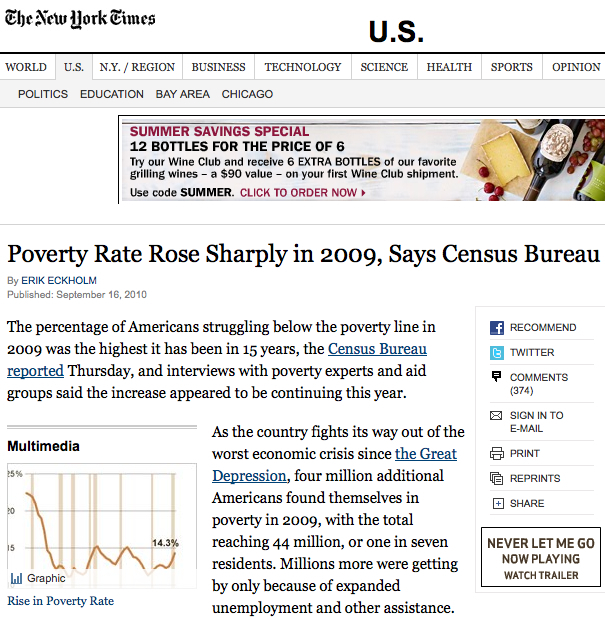 Wonder where the New York Times found their Census data for today’s article on the poverty rate? Find it here at the U.S. Census Bureau’s Income, Poverty and Health Insurance in the United States: 2009 Tables & FIgures. This entry was posted in Government Information, Newspapers, Research Tips and tagged evaluating sources on September 16, 2010 by Cris.